The title sort of seems like a new Harry Potter novel doesn’t it. You horse lovers know what it means. I have selected an article from my friend Lynn Baber which discusses horse training, the secret of the round pen – equine clinicians and how the magic works. Lynn is a veteran of more than twenty years as a national or world champion breeder, trainer, and judge and author. She conducts clinics and presentations both with and without horses as she shares the Christian messages of Amazing Grays Ministry. Equine clinicians have been doing round pen demonstrations for about twenty-five years. Thankfully, the skills of most trainers have improved greatly since the 1980’s. 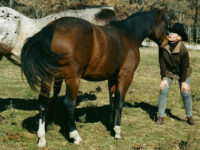 The term “horse whisperer” today describes any effective trainer who uses a relational approach to training rather than one based upon dominance and submission. I know how it works because I’ve done it myself. The usual drill is to take a horse broke only to halter and lead and transform him into a saddle horse in the space of half a day. To newer horse owners and lovers the process seems almost miraculous and the trainer accomplishes his or her usual goal of selling tickets, books, videos, and horse tack. In earlier years, round pen results were accomplished by dominance and submission. Several famous clinicians used to say, “Let the horse’s lungs teach him to pay attention. When the horse is out of air he’ll realize he has to make some other decision.” A few reports surfaced years ago of horses that were ran to death from exhaustion, heat stroke, or injury during these miracle clinics. Few trainers today use such beastly methods to ‘train’ horses. Just in case you haven’t figured it out yet, each of the round pen transformations witnessed by audiences each year is a trick. In no way am I suggesting that the clinicians are anything less than skilled, worthy guys or gals with valuable lessons to teach to those who sit on the bleachers in awe and amazement. However, these round pen transformations are very similar to watching a magician at work. A great deal of skill, dedication, and practice is necessary for magicians to master the illusions that delight fans of magic shows. Likewise, the round pen clinician has spent years acquiring the necessary skill and timing to pull off the trick of instant gratification training with the horses they meet in the round pen. Where’s the Magic in Instant Horse Training? The deck of cards a master magician uses to delight and amaze audiences is not special. It is the skilled hands manipulating the cards that are special. The equipment the equine clinician uses isn’t special either; it is the skill and timing of the person using them that holds the magic. Some magicians are excellent teachers and teach others with a passion for magic to do similar tricks. The path to success is always the same: practice, practice, practice. Not every aspiring magician will be able to recreate every trick with the same level of success as their instructor. Round pen clinicians may also be excellent teachers and train others with a passion for horses to develop the skills necessary to replicate the results achieved by the clinician. And, like the students of magic, not all who try to master the tricks of instant horse training will be successful. Horses are born looking for leadership, security, and relationship with their herd. Successful clinicians who use a relational basis for training build a strong leader-follower bond with the horse who shares the round pen with them. The clinician creates pressure in order to remove it. The clinician proves to the horse that he or she has control over the horse’s feet. Horses need their feet to run for safety when threatened. If they lose control of their feet they may as well cede leadership and responsibility to the trainer. Hopefully the trainer is worthy of such trust. Part of that responsibility is to ensure the horse and owner aren’t abandoned when the show is over. The horse has more information than they did the day before, but the owner would be mistaken to assume he or she now has a trained horse. Worthy clinicians will prepare the horse and owner to work together before leaving for their next gig. Magicians use inanimate objects to perform their feats of skill. Equine clinicians use flesh and blood animals with personality and spirit to perform their tricks of skill. The owner who continues the work started in the round pen is also subject to moods, mistakes, and injury. Preparation is key in training horses. The responsibility of the clinician does not magically end when the newly ridden horse leaves the round pen. Wonderful relationships don’t happen instantly. Horses and their owners learn to communicate and trust each other as skills are learned and failures turn into victories. The process will not yield instantaneous results, but the journey of relationship never ends unless someone quits. Fast results fade just as quickly. Magic tricks are fun and amazing but cannot replace the dedication of relationship. Strong foundations built over time are difficult to tear down. Enjoy the show, recognize it for what it is, learn correct concepts from the clinician, then go home to your own horse and slowly build an amazing relationship of your own. how horses think, how to establish communication with an unbroke horse in a round pen, and how to build an amazing relationship with your own horse. A veteran of more than twenty years as a national or world champion breeder, trainer, and judge, author Lynn Baber conducts clinics and presentations both with and without horses as she shares the Christian messages of Amazing Grays Ministry. Visit http://www.AmazingGrays.us for information on her book. Read Lynn’s daily entries on http://www.BibleandBit.com blog. Thanks for reading Lynn’s great article Horse Training – The Secret of Round Pen Equine Clinicians and How the Magic Works. I’m sure you found it very informative as I did. Lastly, wherever you find a good horse you will also find at least one good dog, usually more. These are typically free spirits enjoying their freedom to roam as they will. Sometimes however, you may wish you had a place to put let’s say a momma dog ready to deliver, or an older dog not willing or able to run all day as before or, one of your dogs is recovering from surgery as will happen from time to time and other circumstances requiring the safety of a den for that wonderful dog, yes and sometimes puppies too. Please visit us to see our complete line of dog crates and heavy duty dog crates then let your imagination run while you think of how these dog crates can help out around your place in the sun.